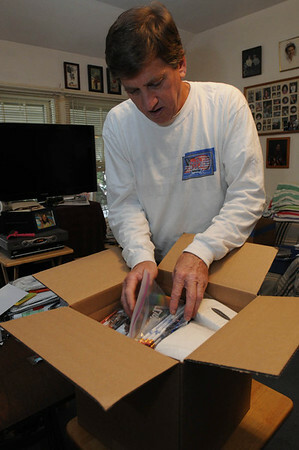 Mark and Janet Brings ship packages at the Marblehead post office and pack boxes at their home in Marblehead as part of Calling All Patriots Troops Support ( C.A.P.T.S ). They send a majority of care packages to the troops from Marblehead that are in Iraq and Afghanistan. Photo by Ken Yuszkus/Salem News, Tuesday, October 4, 2011.